After missing most of the indoor season with a hamstring injury, Sydney Hawkins is more determined and hungrier than ever to keep her crown as the state's best in the 100-meter dash. The Phillipsburg senior star burned up the track last spring, highlighted by an electrifying victory in the 100 at the Meet of Champions in a personal best 11.73, and a third-place finish in the 200m in 23.93 at the New Balance Nationals. The 11.73 by Hawkins was the fastest time in N.J. last year, and broke the Warren County and Lehigh Valley records. The previous Lehigh Valley 100 record off 11.74 (converted from 100 yards) by Vivian Riddick of Dieruff in Pa. had stood for 40 years. The Rutgers-bound Hawkins, the first girl from P-Burg to win an outdoor Meet of Champions title on the track, also ran a PR of 23.91 in in the trials of the 200 at NBN, which is also a Warren Country record and just .01 off the Lehigh Valley record. Hawkins came into this past indoor season favored to repeat as the Meet of Champions winner in the 55 dash, but after winning her first three races a hamstring injury abruptly ended her season shortly after she won the 60m in 7.60 on Dec. 26 at the Bob Burdette Classic at Lehigh University, her final race of the season. 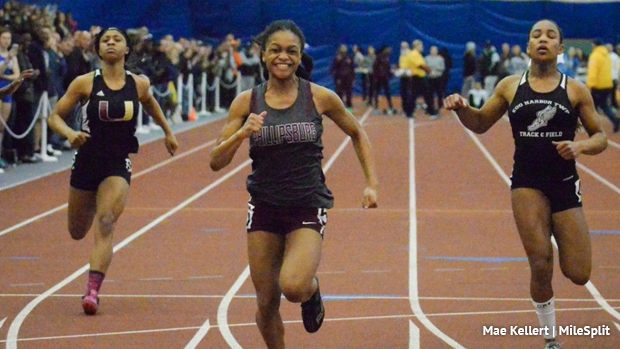 NJ MileSplit recently caught up with Sydney, something no one in the state could do in the 100 last year, for a Q and A about her injury, her recovery, her goals, and her future. Hi Sydney, I am glad to hear you are back training and getting ready for the season. I saw you only had three races this indoor season. Can you tell us how and when you hurt your hamstring and what exactly the injury was (pull, strain etc.)? A: Beginning of January is when I started to feel the pain while I was running at practice. It could've started from two things: the way I was running or because I kept running on a steep downhill hard surface in the freezing cold. I am now trying to run with proper form, because I used to run with my hips rolled forward so I couldn't really lift my knees, which may have caused my hamstring strain. What was the feeling like knowing you would miss most of the indoor season? I know it must have been tough not to be able to compete and defend your Meet of Champions title? A: At first I was disappointed knowing I wouldn't be running the rest of indoor season. I was really hoping to go to indoor nationals since I only went once. But I'll be happy to compete again during the spring, and hopefully qualify for nationals again for outdoor. Tell me about your road to recovery. How long did you have to stop running after you got hurt? A: Since it was just a hamstring strain, I figured it would not take that long to recovery, but I was wrong. I jogged a couple days and rested a couple days, I never fully stopped running, I just toned it down tremendously. I kept going to the trainer at my school for about two month,s but what they were doing was not helping the pain at all. So I went to the orthopedic and they told me to do physical therapy. I did, and I still am doing physical therapy and it has helped relieve the pain greatly. The physical therapist has been massaging my hamstring and getting deep in it, too. I've also been doing small exercises and stretches that focuses on the area to make my hamstring strong again. I know you probably had big goals for the indoor season, so I am wondering in what ways the injury has motivated you and made you even more determined to have a great outdoor season? A: Since I haven't competed since December, I am extremely ready to get back to competing because it's what I love to do! How does the hamstring feel now? Lots of athletes come back and feel even stronger than before an injury? How about you? How do you feel and how is the training going? A: My hamstring feels a whole lot better now. I feel like I can run a full marathon! I'm just now starting to get back to training, and although I may be way out of shape, I still feel the strongest I've ever been. After such a sensational junior year and becoming the first girl from P-Burg to win a Meet of Champions title on the track, what goals do you have for your final high school season in terms of times and places? A: I hope to win the Meet of Champions title again and drop my times lower this year. I definitely want to run mid 11 for the 100 and mid 23 for the 200. I have a long way of training ahead of me in order to meet those goals, but I'm willing to do all the hard work. How different is it for you to come into the season as the defending champion in the 100 dash compared to the way you felt this time last year? Does it feel like there is more pressure to try to stay on top? Do you use that as motivation? A: Last year I had no idea what to expect at the race. This year, I do know what to expect and I'm excited to get back out there to race again. What do you think is your greatest strength as a sprinter/the key to your success? A: Relax, relax, relax. Running relaxed is the best way to race, because if you're tensed up while running, it will slow you down. What was it about Rutgers that made you decide to go to college there? And what do you plan to study? A: Well, I've known the head coach for a little while and I just felt comfortable to have him as my coach. Also there are already some talented young ladies on the team, so I wanted to practice and compete with them to improve together. Plus, Rutgers is close to home! I would be able to go home whenever I want instead of driving or flying hours to get home.